One constant in my life as a boy growing up in Utah, was my family’s annual vacation to Yellowstone. Every year during my youth, my parents loaded the family in the car and made the long drive to Wyoming. As an adult who considers the Westin “roughing it,” I marvel at the accommodations that I thought were so wonderful as a child. My parents rented camper cabins in the park. They were log cabins, and we camped. There were bed frames of wire springs with a mattress on top but no sheets. There was a wood burning stove, but no restroom, no showers, and no heat in the cabin (except from the stove). 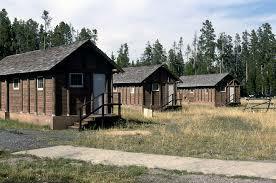 The bathrooms and showers were community affairs, centrally located in the cabin complex. I loved sleeping in sleeping bags on top of the mattress. I loved waking up before dawn to go fishing with father and brothers and sister at the Yellowstone river. I loved returning home with the fish we caught and entering the cabin now warmed by the stove with the aroma of bacon, pancakes, and hash browns filling the cabin. One year when I was eleven or twelve, by father’s brother from Missouri met us at Yellowstone. This injected a new form of excitement into my life for I got to see my cousin Cecil whose nickname was Toughy. I had seen Toughy only 3 times previously. We were friends from the beginning and that year I was so excited to be in Yellowstone with Toughy. I did not know how much excitement was coming for Toughy had picked up a new habit. At night, after a day of sightseeing and dinner, we would play around the campground pretending to be trackers or Indian scouts. Toughy was more interested in hanging around the bathroom. I learned it was because he had cigarettes, and as an eleven year old, had mastered smoking and spitting. He said, “The menthol is in the filter, and I don’t like it.” It made perfect sense to me. I started to answer but my uncle held up his hand, walked into the restroom and dragged Toughy out of the restroom. I did not see Toughy for the rest of the night. My uncle, who owned a bar and was not a lawyer, had conducted a blistering cross-examination with only two questions. That was all he needed to ask. Anyone watching would have known not to believe me, regardless of what I said or how convincingly I said it. That is a great lesson to me as to how to conduct cross-examination. I have seen attorneys wring their hands with glee at the prospect of decimating a witness, and then don’t understand the jury thinks any attorney can make a witness look silly, rules against them. Cross examination is not about destroying people. Cross Examination is a study in truth revealed. Truth is the goal of trial. Truth is what moves juries. Truth should be a lawyer’s stock in trade. We cannot hide from truth. I do not set out to destroy anyone. If the witness answers honestly, it does not matter that he is my opponent – the answers advance my case. I have seen attorneys who upon getting an answer that contributed to their case and helped their client, read from a deposition transcript to impeach the helpful answer because it departed from the deposition testimony. This is an attorney who did not understand his own case or his case’s story. If on cross-examination, the witness does not answer honestly, I do not get upset – the witness has helped me even in mendacity. You see, the jury knows, just as my uncle did, that the answer is out-of-place and does not make sense. The jury then acts accordingly. Wasting emotion reacting to less than truthful answers distracts the jury. Just let the jury do its job. Trust them. Question like my uncle did. Answers to direct questions reveal truth no matter whether the answer is true or not. When you trust the jury this way, and cross-examine for truth not destruction, it feels like walking into that warm cabin with the savory smells of my mother cooking breakfast on the top of the wood burning stove.